3Gstore.com Blog: What's the Difference Between a Cellular Amplifier/Repeater and a Microcell/Network Extender? 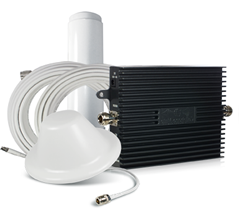 If you're searching for options to improve weak signal for your cell phones or 3G or 4G modems, you'll quickly discover that there are two types of options available: Microcells or "Network Extenders" offered by your service provider and cellular amplifiers made by companies like Wilson Electronics and Cellphone-Mate. If you're like most people, at this point in your research you start wondering what the heck the difference is between the two! Uses your home cable or DSL internet — if you don't have high-speed cable or DSL, you can immediately disregard a Microcell or Network Extender as a potential option! Lots of options for virtually every situation (mobile, small building, large building, etc). Need to boost the signal throughout a large home or office? No problem! Want something you can take with you from your vehicle to your office? There are options for that, too! And everything in between! The very first step we recommend taking when you're looking for a solution for a weak signal issue is to think about what exactly you are hoping to accomplish. Are you hoping to improve the signal just for one phone, or do you have a bunch of devices that need help (and if so, are they all from the same provider?)? What type of signal(s) do you need help with (e.g. Verizon 3G signal, Sprint voice signal, AT&T 4G signal, whatever)? Are you looking for something just for one location, or for taking with you in your RV/car/truck/etc? How large of an area are you hoping to provide boosted signal to? With that information, you can then begin to narrow down your options. 3Gstore will be happy to help you determine what will work best for you — once you've thought about what you're hoping to accomplish, contact us and we'll guide you to the right solution!